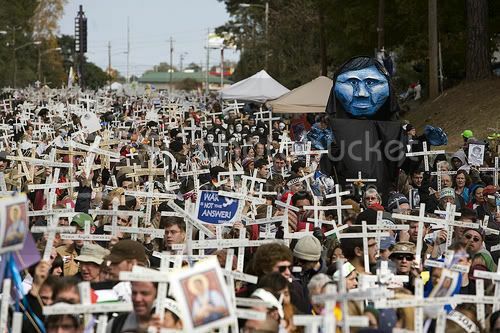 Going on for 20 years now, the mobilization against the training of torturers and killers in Fort Benning, GA is part peace mobilization, part solidarity with Latin America event, part religious pageant, part public face of the Catholic left, and part gathering of the tribes for newly radicalized youth. The gathering draws thousands of people, including nuns and priests, veterans and labor organizers, along with other peace and solidarity activists. They all come for a two-day creative mixture of diverse events that leaves everyone politically transformed and emotionally peaked. This year’s event was no different. Over the weekend of Nov 19-21, close to 5000 people took part is a series of colorful and dramatic actions. Thirty were arrested and held several days by police. Four of these were arrested after intentionally committing civil disobedience by climbing over a fence topped with barbed wire at the entrance to Fort Benning. 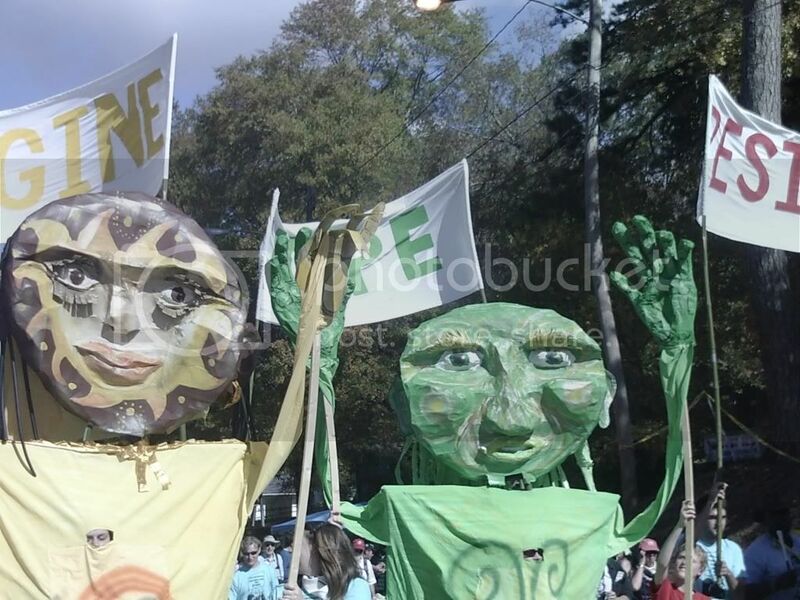 Others were arrested for simply straying off a sidewalk in an attempt to march to downtown Columbus, GA. Local courts imposed heavy fines and maximum sentences. Why is the U.S military training torturers and death squads? The answer is an old one: wealth, power and intimidated, non-union labor. “For the past several decades, the US has allied with dictators in Latin America who helped that region’s small, elite group of wealthy landowners,” said SOAW founder Father Roy Bourgeois, a Louisiana native, who lives just outside the gates of the school in Fort Benning where he carries on his work. The procession lasted for hours as the column of mourners bearing crosses of the dead walked from the front of the stage up one side of the street to the police barriers and back down the other side of the street to the back of the stage. There they placed the crosses into the chain link fence blocking the entrance to the military base. Many mourners cried. Some raised their fists. Some knelt in prayer or meditation as the singing of the names and the chant of “Presente!” continued. Behind the stage a theatre group staged a scene of murdered members of a religious order, their bodies spattered with blood. Others snapped pictures or stood quietly. As soon as a young man approached the fence military loudspeakers surrounding the entire area blared a recorded message asserting that the military base was a legal entity and operated under the U.S. Constitution and that crossing onto base property was a federal crime. Cheering and applause roared up as the young man climbed the fence, crossed the barbed wire top and dropped onto the grass. Before he could reach the second fence he was apprehended and cuffed by the military police. On the east side of the street up the hillside crowds of neighborhood residents stood silently in their yards observing the ceremony of remembrance. Over its 59 years of existence, the SOA, frequently dubbed the “School of Assassins,” has left a trail of blood and suffering. It has trained over 60,000 Latin American soldiers in counterinsurgency techniques, sniper training, commando and psychological warfare, military intelligence and interrogation tactics. Among those targeted are educators, union organizers, religious workers, student leaders, and others who work for the rights of the poor. Hundreds of thousands of Latin Americans have been tortured, raped, assassinated, “disappeared,” massacred, and forced into being refugees. Shannon is a national committee member of the Committees of Correspondence for Democracy and Socialism. 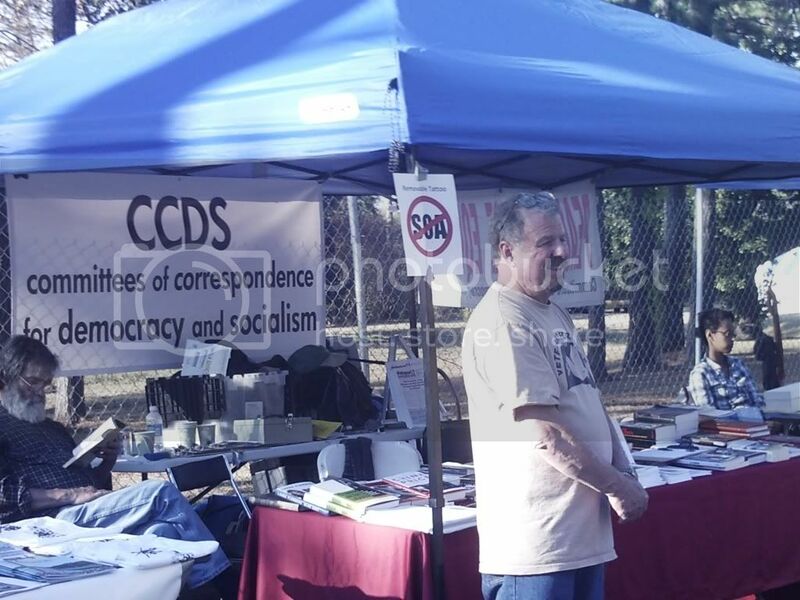 Together with Jim Skillman and Steve Wise from Atlanta, along with me, we comprised a team of four who worked the CCDS book and literature table, as well as taking part in many of the events. Randy made the long drive from Pennsylvania the day before, so we were early arrivals on Saturday, Nov. 20. We managed to get our van unloaded and table set up before 9am. The School of the Americas Watch team had the area well organized. A strikingly decorated stage was constructed near the double barbed wire topped fences blocking the entrance to Fort Benning. The stage was at the foot of a 10-block-long section of a street that was had been blocked off by police. The wide corridor with tall loudspeakers stationed every few blocks, provided excellent acoustics. Homes of local residents were on one side of the corridor, and many had food concessions on their lawns. On the other side of the street was a chain link fence, against which a long line of booths for political groups and vendors were arrayed. On the other side of the chain link fence was a grassy area patrolled by military and local police. Before long, the buses start arriving. They came from across the South and the Midwest, up to Minnesota, down to Florida, and out to Nebraska. A good number were from small Catholic colleges and universities, and loads of students, along with the nuns, monks and priests who taught them, unloaded with smiles and excitement at being there. "As an activist since the 1960s,” said Atlanta’s Jim Skillman, “I find it intoxicating to be in the midst of so many justice-minded young people." A Vietnam veteran, Skillman had joined SDS at Georgia State after leaving the army in 1967, and has been a dedicated labor, peace and human rights organizer ever since. 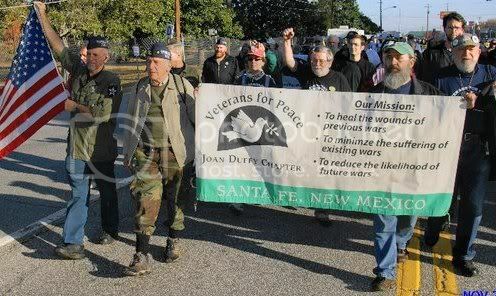 Other veterans started showing up in batches. They gathered around the ‘Courage to Resist’ table, a group of today’s Iraq and Afghan vets. They were featuring a display defending Private Bradley Manning, facing 50 years in prison for being a whistleblower leaking information about war crimes in Iraq. A variety of religious forces also began arrives. A group of Presbyterians unfurled a banner. A group of Buddhist monks of Nipponzan Myohoji, Atlanta Dojo walked more than 100 miles as a walking prayer to ‘Close the SOA.’ They averaged 15 miles per day, staying in churches or supporters' homes. .
Our CCDS table quickly became very busy. We came up with the successful idea of making a thousand small water-applicable ‘No to SOA’ tattoos, the letters SOA with a red circle and slash. ‘Get a free tattoo! Just sign up with your email for our CCDS newsletter!’ We were surrounded by eager signers for the entire two days. Naturally, some of the taboo applications turned into longer discussions and book purchases. It was a lively time well spent. A far larger feature of the weekend than activity at the tables, however, was an ongoing tension shaping up with the police, military security and the FBI, who are all present in force. The strategy of the SOA and local authorities is apparently to find every possible minor transgression to crack down hard on participants, to impose quick and severe penalties for planned civil disobedience, and where no problems exists, to use undercover agent provocateurs to create division and trouble. The Columbus city police headed the security preparations this year, assisted by the Muscogee County sheriff’s and marshal’s offices, Fort Benning’s own military police force, and a number of undercover agents disguised as protestors. When defense attorneys tried to question Agent Stinson on the stand to learn more about her team’s operation, the judge ruled that she didn’t have to answer, and she didn’t. For the minor incursion of stepping into the street, each protestor was hit with $5000 in bail and six month jail terms. Sunday morning began with a march of about 100 veterans, followed by music from the stage, mixed with appeals for bail money for those arrested the day before. One visitor to our table on Sunday morning was Bob King, the newly elected president of the United Auto Workers. Randy talked to him about the jobs crisis, and sold him our pamphlet on full employment. King has been at the SOA Watch protest many times, and has led a U.S. trade union delegation to El Salvador. This year he was a featured speaker, and took part in the procession with his daughter. “The SOA has a terrible history,” said King from the stage. “Its graduates were involved in some of the worst human rights abuses in South and Central America including the assassination of Archbishop Romero and six Jesuits priests at the University of Central America in San Salvador. Those of us who have democratic rights must be a voice for those less fortunate who do not have a voice because of the terrorism they face." A speaker from Resistencia in Honduras also detailed some of the atrocities carried out by the Micheletti and Lobo regimes since the June 28 coup. The new Wikileaks exposes may well reveal a less-than-neutral hand by the Obama administration. As the speeches concluded and the procession was underway, the planned civil disobedience of climbing the barbed-wire fence into Ft. Benning got underway. This year four people took that step. Two of them, Louie Vitale, OFM, who crossed the line for the fourth time, and David Omondi, of the Los Angeles Catholic Worker who crossed the line for the first time, pleaded ‘no contest’ and were immediately convicted in federal court. They each received a six month prison sentence from U.S. Magistrate Judge Stephen Hyles. Nancy Smith and Chris Spicer, the two others who crossed over the fence, will go to trial January 5, 2011. A number of reports noted that this year’s SOAW effort was smaller than the peak of 20,000 years back. Part of the reason was that this year's efforts were divided between those who came to Ft Benning, and others who had lobbied Congress earlier this summer. In any case, given the high spirits and determination of those who came this year, the struggle will be ongoing. Hands Off the DPRK, No More War!